Why did I ride? Oh yeah, there’s a man involved. A lovely, gentle introduction to riding bikes—a vintage enthusiast, I’d never have got on a bike if I’d been out with a sports biker. So waving one (restricted) license, I set out determined to buy an 883 Sportster. I don’t understand how or why at 5’2” and 119 pounds I ended up in the cruiser camp. Probably because that man taught me the sheer joy of the ride and the need never to go anywhere in a hurry. I gradually widened the search as my budget constrained me and sad as I was to see my 125 Marauder go, I was desperate for something with more power and less wobble. And on a visit to a local dealer one day, to look at a Shadow, there was the VN. Sitting somewhat apologetically next to its (too) big brother, the 900 Classic. I sat on it. 3 weeks later, I choked back the tears leaving my little Marauder and nervously eyed the VN. It was like a battleship compared to the 125. I got the 15 miles home without incident, and promptly spent another 2 weeks or so getting the bike fixed up after two very problematic drops on my slopey and slippery driveway—replacing a broken indicator and bent clutch lever, getting crash bars fitted, wondering if I’d made a very expensive and heavy mistake. And now? Now I move around very carefully at a standstill. And me and this VN are just starting to get to know each other—how we handle in corners, the wind seemingly threatening to pull off your helmet as for the first time I’ve got proper acceleration. The lovely smooth click of the gears and the reassuring deep and quiet rumble of the engine. You may keep your Harley's and their loud pipes. It is a truly frightening and truly exhilarating experience. And the man? Well, that was over a long time ago, pain and heartache and emotional toil. But time heals all wounds. I’m happy with someone else, but he’s always been in my rear view mirror, the one who took two and a half hours off work to pick up the VN with me, and who never judges me for wobbling round tight bends. The fairing you see peeking out at the back there is his Royal Enfield Classic Bullet 500. I couldn’t have done this without him. One day, I don’t think he will be in my rear view mirror any more; our lives will change. And I will bust out of my driveway on a glorious summer evening—because of a friendship that gave me my wings to ride for myself. Wings branded with a V.
Thanks for sharing your story! What a nice read. I was born in England and left to come to Canada in 1972. I went back for the first time in February, 2010. One of the things that really impressed me about England was the amount of motorcycles I saw. They always brought a smile to my face. There were a lot of bikes that I did not even recognize. You look very comfortable on your motorcycle. Danygirl, very brave of you to do this on your own. I think you're doing exactly the right thing--start slow, build up your confidence, you'll be on that Shadow really soon. Try checking out the web to find clubs and other women riders in your area, as well as this site, of course! It's nice to have a buddy to ride with but mainly, it's just getting out there :) Have fun, ride safe. What a wonderful Dream come true! I am 54 years old and I started learning at 50 but I'm alone and I don't like to ride by myself to begin so I don't go out very much. I would like to find a kind et gental man to give me my winds too. I am a nice, easy to learn and patient person but the two men who could of been there for me rather have me sit on the back. I find that very selfish. 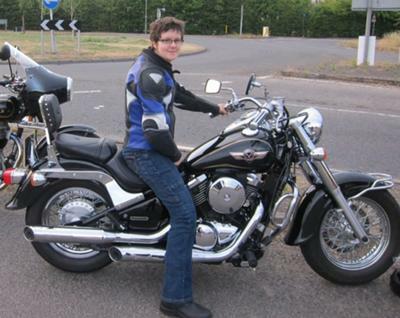 I have a Honda shadow 2007 and I bought a honda rebel 250 to practice alone. Some day My Dream will come true! Oops, I guess I made a typo in the title of the post--my bike's a VN800 classic, not a 900. Thanks for sharing your story Hannah! I bought a 2007 Triumph Bonneville sheerly for emotional reasons. Although I loved my British racing green bonnie, I realized I loved long rides thru the countryside. I would crawl off the bike after 60 miles of riding. She is meant for short distances - that's it. With tears in my eyes I sent her back to the dealer where another women bought her the next day. I bought a 2002 Yamaha 1100 VStar Classic cruiser. He has long fenders, windshield, saddlebags & trunk. He is very powerful and I can ride him all day with little to no fatigue. I live to ride! Rock-on Hannah!! Thanks Sandra! It sounds like you hung on in there til you got it right. I like that about women riders--generally, they are never afraid to admit it went wrong, or that they found it hard to carry on--but we do!